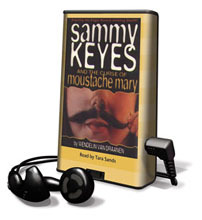 "In this fifth Sammy Keyes mystery, the normally unflappable heroine encounters a corpse, an arsonist, and an irate policeman -- and her first real experiences with adolescent angst. On a quiet weekend in the country, Sammy and her friends meet Lucinda Huntley and her 200-pound pig, and become involved in a centuries old family feud involving Lucinda's great grandma Moustache Mary. When Mary's pioneer cabin burns to the ground, it's up to Sammy to dig up the cause as the past collides with the present in this highly combustible mystery!" In this fifth Sammy Keyes mystery, the normally unflappable heroine encounters a corpse, an arsonist, and an irate policeman -- and her first real experiences with adolescent angst. On a quiet weekend in the country, Sammy and her friends meet Lucinda Huntley and her 200-pound pig, and become involved in a centuries old family feud involving Lucinda's great grandma Moustache Mary. When Mary's pioneer cabin burns to the ground, it's up to Sammy to dig up the cause as the past collides with the present in this highly combustible mystery!